Did you know that Argyle Feed & Hardware has loyalty club savings opportunities that can help you save money on your pet and overall purchases at our store? Check out below and start saving at Argyle Feed & Hardware. Bring your new puppy (12 weeks or less ) or your newly adopted dog (with adoption papers) to Argyle Feed, sign up for our Pup Club and receive one (1) free 5-pound bag of Exclusive or Infinia dog food. One free bag per email address, not per pet. Valid for new puppies or adopted dogs with proof of recent adoption papers. Pup Club members receive a monthly email reward. 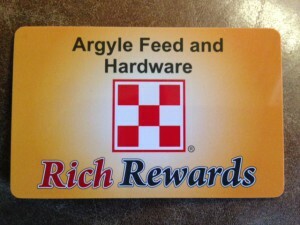 Bring the email coupon into Argyle Feed to redeem your reward or savings each month. One membership & email per family (not per pet). Valid for 7 days, no reproductions or copies. Submit a picture of your pet to us monthly via our website or post one to our Facebook page. We’ll pick one lucky photo each month to feature in our monthly newsletter. Take advantage of our Frequent Purchase Club! Purchase 8 bags of PMI Exclusive, Red Flannel or Infinia dog food and get a bag free! 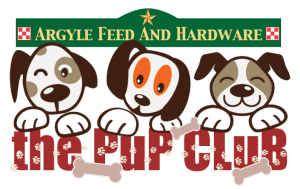 It’s a great time to join Argyle Feed’s Pup Club! Bring your pups and visit us at the store to sign up today to get your free gift! This entry was posted on Thursday, May 10th, 2018 at 10:54 am	and is filed under News & Updates. You can follow any responses to this entry through the RSS 2.0 feed. Both comments and pings are currently closed.